Tangyuan or tang yuan (simplified Chinese: 汤圆; traditional Chinese: 湯圓; pinyin: tāngyuán) is a Chinese food made from glutinous rice flour mixed with a small amount of water to form balls and is then cooked and served in boiling water. Tangyuan can be either small or large, and filled or unfilled. They are traditionally eaten during Yuanxiao or the Lantern Festival, but also served as a dessert on Chinese wedding day, Winter Solstice Festival (Chinese: 冬至; pinyin: Dōngzhì), and any occasions such as family reunion, because of a homophone for union (simplified Chinese: 团圆; traditional Chinese: 團圓; pinyin: tuányuán). Historically, a number of different names were used to refer to tangyuan. During the Yongle era of the Ming Dynasty, the name was officially settled as yuanxiao (derived from the Yuanxiao Festival), which is used in northen China. This name literally means “first evening”, being the first full moon after Chinese New Year, which is always a new moon. In southern China, however, they are called tangyuan or tangtuan. Legend has it that during Yuan Shikai’s rule from 1912 to 1916, he disliked the name yuanxiao (元宵) because it sounded identical to “remove Yuan” (袁消), and so he gave orders to change the name to tangyuan. This new moniker literally means “round balls in soup”. Tangtuan similarly means “round dumplings in soup”. In the two major Chinese dialects of far southern China, Hakka and Cantonese, “tangyuan” is pronounced as tong rhen and tong jyun respectively. The term “tangtuan” (Hakka: tong ton, Cantonese: tong tyun) is not as commonly used in these dialects as tangyuan. 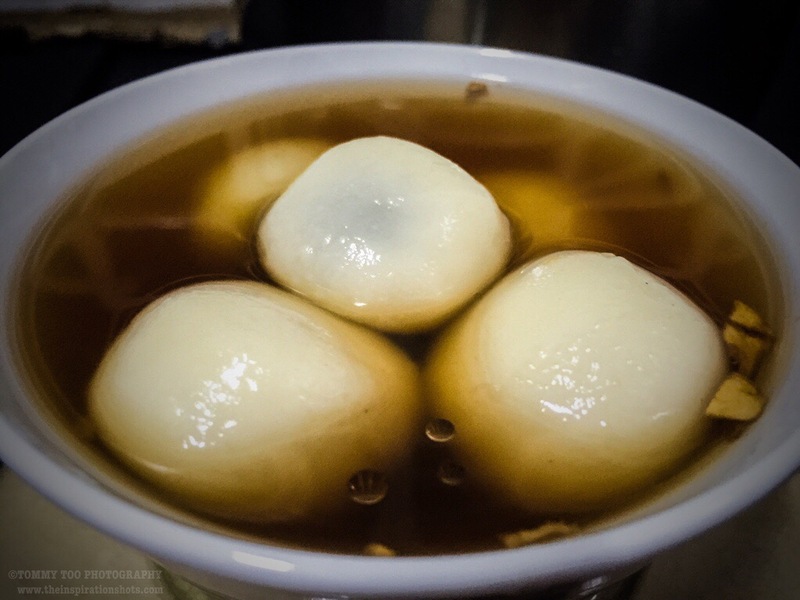 This type of glutinous rice flour dumpling is eaten in both northern and southern China, but the name “tangyuan” is more common in the south while the older name “yuanxiao” is still used in the north. The fillings differ regionally: in the south, sweet fillings such as sugar, sesame, osmanthus flowers, sweet bean paste and sweetened tangerine peel are used, while in the north, salty fillings are preferred, including minced meat and vegetables. The method of preparation also differs. According to Hao (2009), yuanxiao are made by placing balls of filling into a basket filled with glutinous rice flour, and then shaking the basket while sprinking water over it so the flour becomes a coating. Tangyuan, on the other hand, are made by starting with balls of rice flour dough and inserting the filling into these. For many Chinese families in mainland China as well as overseas, tangyuan is usually eaten together with family. The round shape of the balls and the bowls where they are served, come to symbolise the family togetherness.